Hello friends. Welcome back to the show. 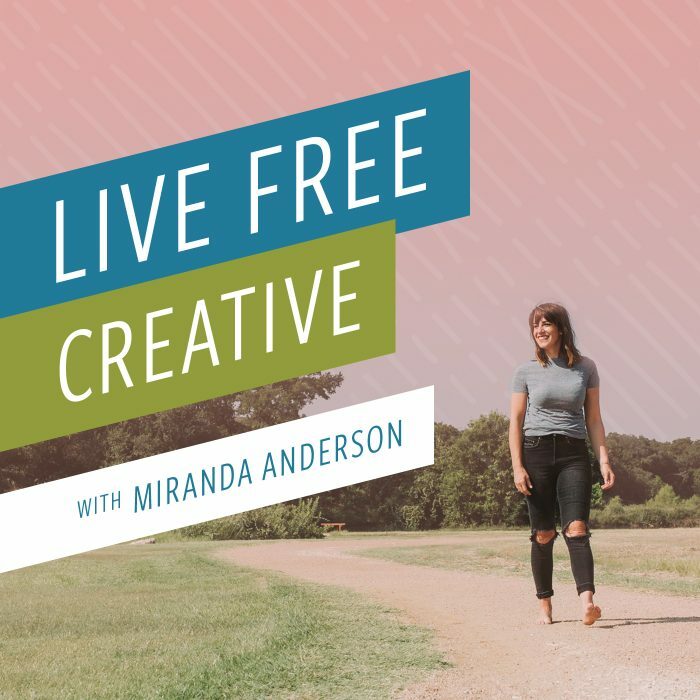 I’m Miranda Anderson and this is episode 32 of Live Free Creative: budget travel tips. I’m super excited to share this week’s episode because so many of you have asked for it. I share a lot about the different adventures that I take both by myself and with Dave and with our family as a whole. Travel is a huge priority for our family and it’s a big part of our life and I love that that resonates with so many of you and also if you didn’t grow up that way or it hasn’t been a big part of your life, sometimes you feel like the finances can be a big barrier, a huge obstacle, and you wonder how everyone is traveling all the time. So I want to give you just a few fun, easy tips today. Then maybe it will just give you some new ideas about how you could approach the idea of planning adventure is and travel both by yourself with uh, partners or friends or with a family. And before I dive into those tips as an appropriate segment for today’s episode, I want to share a very recent, very magical adventure moment. Something that has been so fun for me as I’ve been sharing these magical adventure moments on the podcast is that I find myself noticing them on my trips and also just in my life. That’s a really fun side effect of paying attention to something and sharing it. Those things that you focus on really do start to be the things that you notice. So this magical adventure moment happened a few weeks ago when I was in Montserrat, Spain with my sisters and my mom. We had just spent a few days touring in Portugal, which is an incredible city, and I will link my blog posts about the trip in the show notes. We then flew up to Barcelona and we spent a day wandering around Barcelona. And then we took a day trip to Montserrat, which is a 900-year-old monastery that’s built nestled kind of in the saddle of a mountain, about an hour outside of Barcelona. The area is beautiful. The landscape is incredible. This giant kind of rock craggy mountain rises up out of what otherwise is it fairly low lying hill area and the way that you get yourself from the ground up to the monastery is either by hiking, by train or by aerial tram, which is the option that we chose. We took a train from Barcelona, we got out to the aerial tram road in this tram does flying high above the cliffs up to the monastery area. And we got there and checked in and they told us that the boys choir would be singing in about an hour. So we wandered around, we did an audio visual tour and then we went and took our seats in this beautiful giant Cathedral. The history was just oozing from the walls and from the arched painted ceilings, the ordinate wood details lamps that had been gifted to the monastery from around the world floated hanging along the edges of the room. Over a hundred people found their seats and just kind of sat in awe waiting for this boy’s choir that’s part of the monastery school to come out and sing for us. We all rows as they walked in lines of boys between the ages of nine and 15 or 16 all wearing white choir outfits. And they just walked in quietly and lined right up. And of course as you look throughout the crowd, you can imagine this is 2019 so what is every single person in the crowd doing? You’re right. They’re videotaping it with their iPhone. The entire giant crowd was standing up watching the boys come in filming with their iPhones or in some cases with camp quarters or with DSLR cameras and then they start to sing and it is beautiful and incredible and we’re all still standing there taking pictures and filming. And I had this thought, this is so weird that appear. I’ll just standing here filming and capturing it. Of course, it’s great to capture memories for the future, but I have the thought, what about just experiencing the present and so I put my phone in my pocket and I closed my eyes and I just listened as the voices of these choir children echoed through the giant arches of this beautiful cathedral. I don’t know that there has been a time in my life that I felt like the phrase a choir of angels made more sense or felt more appropriate than standing there listening to these sweet voices and just for a minute, maybe two minutes, I was so present. I was just there. Just hearing it and feeling it and recognizing how really important and beautiful it is to find myself present in my own life, no matter where I am. The thought crossed my mind as I was sitting there absorbing and enjoying this really wonderful experience. I thought, this is a magical adventure moment. This is a moment that I will not forget because it is so sweet and so special and because I’m right here in the middle of it. Now that you all want to go to the top of the mountains in Spain and listen to the incredible choir sing. Let’s talk about some budget travel tips. My first budget travel tip is to plan ahead. I think that there are a lot of reasons that this one is especially helpful. One is just as good for the budget to plan ahead and know what’s coming at them to be able to sort of designate finances toward a certain trip or maybe save up and earn for a trip. One of the really good things about planning ahead is that you can take advantage of deals when they arise, which is often far in advance. One specific example from our experience that I have of this is that in 2017 we knew we wanted to give our kids a trip for Christmas. We didn’t know exactly where yet, but we were looking and I had my eye on airline flights, specifically using a service that I’ve talked about before called nextvacay and I will put a link to that in the show notes. I know a lot of people have asked about it. So next vacay is this $30 or $40 a year program where they send you emails when cheap flights to anywhere come up from the home airport that you have entered. So I have mine as Richmond, but we also get cheap flights from Raleigh, North Carolina, and from the DC area, which you’re both a couple of hours drive from where we live. There are other services I’ve heard of one called “Flights From Home”. They don’t operate in my airline area and so I haven’t used that one. But what happens when you’re planning far in advance is that when an opportunity arises that is unexpected that you can jump on it. So we were looking for somewhere fun to go and I had sort of tentatively decided that I’d like to go to Italy because it was somewhere that we hadn’t yet been as a family or as individuals… and pizza and pasta and Gelato. So I mean really Italy will never be a bad idea. I got an email in September of 2017 that said that there were round trip tickets from Washington DC to Rome, Italy for $250 per person. That is a very inexpensive flight to Europe and granted we live on the east coast and so all of the flights to Europe are a little bit less expensive than other places in the country, but that is cheaper than we could have flown to Florida or even home to Utah or maybe even to New York. This was a very inexpensive flight. The was that the tickets were available in the spring of the following year, so I couldn’t buy them in September and use them in December. I was buying them in September to use in April of the following year. That worked out fine for us because we were able to give the gift as a Christmas surprise and then we came up with a clever way to do a count down as a family until we took the trip for spring break. So we planned far in advance to be able to take advantage of those really inexpensive flights. Flights are almost always cheaper when you’re looking at advance. Hotel rooms are often cheaper when you’re looking at advanced because as they get closer to being booked up and full, the rates go higher as the demand increases. In episode 17 I share a lot about this idea. It’s an episode about planning your year and I shared that in November, December of each year we like to plan at least an outline or some big ideas for things that we might like to do in the following year, including the trips that we hope to take. Having a really wide view on all of the upcoming possible vacation plans allows us to recognize opportunities that would work for us when we see them. So just like those airline flights or if you happen to see a special two for one deal on a cruise or a or a discount weekend at your favorite hotel. If you have planned in advance on the timeframes and the types of trips that you want to take, you recognize those and you’re able to then travel for a little bit less than you otherwise might. Budget Travel Tip number two is to get in the car and drive, especially with a family. It can be a lot less expensive to drive to a destination even including cheap hotels. Then to fly the entire family where you’re going. Now of course it depends on where your destination is and how long you might want to spend there and how much time that you have to spend traveling anyway, but if you’ve been listening to the podcast for a while, you probably know that we are a big fan of road trips around here. Putting all five of us in the minivan, paying for a couple of tanks of gas and a night or two in a lucky into or holiday inn along the road is not only an inexpensive way to get from point A to point B, but for me and our family, it’s a really fun part of the trip. We treat the road trip as part of the vacation. What that means is that my kids get to do fun activities. We stop and get red boxes along the way because we can put them into the next red box in the next town. We like to stop and eat outside of the car as often as possible so we don’t go to expensive restaurants, but rather than always driving through eating on the road, sometimes it’s fun to stop into little dinky holes in the wall in the little places along the way. And like I mentioned, our budget hotels, we like to stay as a family on a road trip in inexpensive mid level hotels that include a free breakfast and I will tell you that free breakfast, those waffles, Texas shaped waffles when we lived in Texas. Waffles and eggs and whatever they serve in the, the breakfast is my kids very favorite thing. They like that more than anything. So don’t rule out a road trip as a budget friendly. Wait to see some more places that you might not be able to afford to fly to right now. If you’re a little weary about road tripping with kids, I’m going to link, I have at least three or four blog posts and a youtube video that I’ve done sharing all of my insider tips and tricks for road tripping with kids. You can hit the show notes, livefreecreative.co/podcast check those out so you boost your confidence on actually doing the road trip with the family budget travel. Tip number three is to do shorter trips. There was a time in my life when I didn’t consider a vacation, a vacation, unless it was a week long. Seven days felt like a minimum for me to really be on vacation. Now let me tell you, I have learned my lesson that not only is a shorter trip, less expensive by a lot, you know proportionally to the number of days that you’re gone, but also a short sweet trip can be so enjoyable. You get all of the anticipation, you get all of the fun feelings of being on vacation and that experience. It doesn’t have to absorb either your time off or your budget for travel for the whole year. Taking shorter vacations is a very, very simple way to travel for less. Now, Dave and I learned this specifically when Milo was about 10 months old and we decided we wanted to go to Jamaica for spring break. Now, the shoestring travelers that we were, we decided to stay in a guest house. It turned out to not have hot water or air conditioning, which if you want to talk budget, travel tips, staying in hostels and guest houses instead of nice hotels is definitely a cheaper way to travel. Although not always the best way to travel. We really enjoyed pieces of the trip, but by day two or three we were thinking, gosh, we’re ready to go home. This is kind of fun and also kind of hard. It was our first time traveling with a baby and we realized quickly that it was not the same vacation that it had always been. And so we agreed that for a while, at least the next year or two when we took trips with our kids to destination locations, not going home to see our family, which is a whole different thing, but when we took destination vacations, we would do it for a shorter period of time. We thought three to four days was a perfect vacation with kids. So we like to contrast that experience that we had spending the same budget over six days in Jamaica to the experience we had a couple of years later when we had both Milo and Elliot and I was pregnant with Plum and we went to Costa Rica as a family. We spent some days there with my entire family, my parents and all of my siblings and all of the cousins and that was really fun. But since we had flown there, we decided why don’t we do a couple days as just our own little family unit and the same budget that we used for our whole trip in Jamaica, We put into two days at an all inclusive resort in Costa Rica and my friends, it was so much better. Doing a really short trip in a really nice place with a fantastic pool, air conditioned rooms, which you know, I know that’s like supposed to be just a baseline, but when you’re a budget traveler like we have been in our life, all bets are off. We loved having the meals included and having snacks by the pool and that’s not something that I would have thought that I would ever be super into, but I can tell you that it can be really, really nice to know the cost upfront and to pay it all and then to not have to deal with questioning every purchase along the way. So taking shorter trips is my third budget travel tip, but because I’m on this coin, I want to roll into tip number four, which is to choose all inclusive if that’s the type of trip that you’re looking for. Now, cruises and all inclusive resorts are unique in that the cost is all encompassed. You pay for the days or the trip that you are there, and then you have your meals at several available restaurants. In most cases you can get snacks, you can get drinks, there are things above and beyond. You can choose to go on excursions that costs money in addition to whatever the baseline is. But if you want to know what your entire vacation is going to cost right from the beginning, it can be really nice to choose an all inclusive resort or a cruise. I feel like I can’t talk a lot about cruises because I haven’t ever actually been on a cruise. The idea is the same though that you can choose and everything feels really clear up front and then you can enjoy it all along the way and because everyone likes to travel a little bit differently. I want to share budget travel tip number five, which is one that we actually use a lot and this is in direct contrast to number four so I understand that some of these are going to conflict with each other because I don’t think there’s one right way to travel inexpensively. I think that it really depends on where you want to go, who you want to travel with, and what types of things you like to do on vacation. So number four was all inclusive. Number five is to eat and live like a local for as long as I can remember. This has been my very favorite way to travel inexpensively. What this looks like is staying in an Airbnb instead of a hotel. There are really, really fun Airbnbs all over the world in every city that give you a little bit of taste of living like a local and they can often be a fraction of the cost of a hotel room, but instead of a hotel room, you get an entire apartment. If you follow along on Instagram or you’ve seen any of my travels, you know that Airbnb is the way that I like to travel and in fact I have a really great discount code for people who have never used airbnb. Go to the show notes for episode 32 at live free creative.co/podcast and you will find a link that will get you $40 off of your first night. Stay at any airbnb anywhere, depending on where you stay. That could be half of a night. So it’s really, really a fun way to travel. Another reason that I love airbnb beyond the cost is that they’re really cool. There is some fun personality. I’ve stayed at an airbnb that was a really modern, all white flat with huge floor to ceiling windows in New York City. I stayed in an Airbnb in Austin, Texas. That was an airstream in the backyard of a person who had chickens and donkeys and goats and a pig on the property for the guests to enjoy. We stayed at an Airbnb in Rome on Via Giulia that was one of the most incredible apartments that I’ve ever been in in my life. I wanted to just move in. It had beam ceilings, giant cathedral windows overlooking the city, an incredible art on every wall. It felt like we had become this really classy Roman family. We just stepped into their apartment and started living like a really cool local Roman might have lived, so staying at an airbnb instead of a hotel is one way to live like a local and travel on a budget. Another is to shop at markets instead of eating out at tourist restaurants. We also love street food and the local dives where people who actually live where you’re visiting are eating rather than at the American chain restaurants that you can find in every city around the world. Now again, living and eating like a local is not always everyone’s favorite scene. Sometimes people want to travel and travel in luxury and eat at fine dining restaurants. We have had some of our most wonderful, incredible experiences traveling by trying to experience as close to the local vibes as we could. There are a couple of ways that I like to find the local restaurants. One of them is to simply Google search whatever city I’m staying in and great local food or best local restaurants. Another that I’ve been using a lot recently is to use Instagram. I feel like Instagram is such a robust, well used platform and so I use the search bar and I will search hashtags for the city I’m visiting plus food. For example, #BarcelonaFood or #BarcelonaFoodie people who are eating locally. Sometimes their actual Instagram media and sometimes they’re just people who are visiting the city or who live in the city and like to share where they’re eating around town, using some kind of wide based hashtags like those. Okay. Eat and live like a local. That’s number five. My sixth budget travel tip is to break up your stay. Now what I mean by this is that you don’t always have to check into one fancy hotel and stay there for the whole time. For example, a lot of times as a family when we lived in Texas, we left to go to west Texas where there is one of my favorite places to stay ever. That’s called El Cosmico in Marfa, Texas. It’s really funky, these cool vintage trailers and tps, but it’s not super inexpensive. So what we like to do when we go is to go camp as a family, which I know is not everyone’s thing, but it’s definitely a budget way to travel. We will go spend three nights camping in big bend national park and then spend one or two nights in El Cosmico in Marfa on our way home. So we break up the trip into a super budget friendly, $15 a night camp site, cooking over the stove, hiking and sitting in the hot springs type of vacation and then we finish it off with a fun hotel stay. I’m going to always recommend if you’re breaking up your stay to leave the more expensive or fancier more luxurious stay for the end of the trip because you’ll feel it a lot more going from a five star hotel into a camp site. Then you will going from a camp site into a five star hotel. Another way that we have broken up our state was simply by changing hotels. An example is a few years when Dave and I went to Kuwait for our 11th anniversary, I had heard incredible things about the St. Regis Resort and hotel in Princeville on the north shore is not a cheap hotel. It was the nicest hotel that I had ever stayed in and it was worth every single penny, but we didn’t spend our entire seven days staying there. In fact, I had a good friend who had just recently been to Hawaii who text messaged me and said, the Saint Regis is worth just one night for the experience. You have to stay just one night. And so we booked part of our trip at the Saint Regis and part of our trip in a different hotel down on the south shore, which was convenient so that we could see both sides of the island, but also convenient because the second hotel was not as expensive as the first, so we were able to experience a taste of the luxury without having the entire trip be booked at a really expensive hotel. So depending on the type of trip that you want to do and the type of traveler that you are in general, you can think about a couple different options, a less expensive option, and maybe a more of a splurge option and break up your trip even on the same trip so that you’re able to get a little taste of both without breaking the bank. Okay. Last tip. Number seven. Don’t feel like you have to do it all. I find that a lot of people travel and feel like they want to pack in every single museum, every single tour, every single site, all of the best restaurants, every single, like it’s like they run around, frantic with their heads, cut off trying to do and experience and see every single thing. And what ends up happening is that you do so much and spend so much and then you don’t necessarily enjoy any of it. It’s like you overschedule and overwhelm your vacation. And so my advice here is to not do it all. Choose one or two things each day that you really, really want to see or do or eat. Just that many. Choose one or two things each day that are really important to you and then allow the rest of the day too. You can plan it but don’t fill it completely. 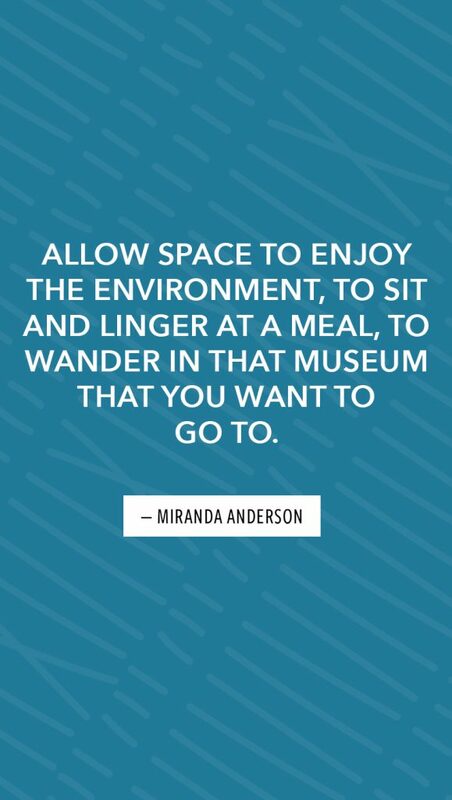 Allow space to enjoy the environment, to sit and linger at a meal, to wander in that museum that you want to go to. Enjoy the journey along the way. Because I can tell you this from experience of traveling a lot over my entire life, it doesn’t always go the way that you expect it’s going to go. In fact, it never goes the way that you expect that it’s going to go. So when you allow yourself a little bit of freedom and only choose a couple things that feel really, really special each day, that allows you to really focus on those and to make them great and to not worry if something gets off the rest of the day. Along with this one, the don’t do at all. I feel like it can get really expensive really fast when you pay attention to what all of the companies that are selling adventures and experiences while you travel are telling you that you need to do. For example, you land in Cancun and immediately you are presented with opportunities to go snorkeling, to go swim with the dolphins, to go deep sea fishing, to get your hair braided and put beads in it. To go to a local tritium factory and learn how to make tortillas, to learn how to do Mexican pottery. To go kite sailing, to go paragliding to get a Henna Tattoo of a sea turtle on your lower back. I mean you are immediately inundated with people who are selling you on the joy of the experience that you could possibly have. And I want to tell you that you can have a joyful experience if you choose one or two things that sound really fun to you and don’t feel the Fomo, the fear of missing out on all of the other things that other people might really, really enjoy it, that you probably wouldn’t enjoy anyway. Do not spend $120 to go ride a boat out to see the spinner dolphins. If you don’t really like being on boats and you get a little bit of sick in the bumps, vacation can be a time than we get a little bit overwhelmed by the expectations of having this magical adventure. And it doesn’t always come through the avenues of paying the most for the experiences that are tailored to create the experience, if that makes sense. Most specific packages that are tailored for a tourist, quote unquote tourist will not give the same level of really interesting, wonderful, authentic experience that I will have for free just going out on the town just sitting on the beach and admiring the area. And so number seven is just don’t feel like you have to do at all. Don’t be overwhelmed by all of the glossy brochures in the hotel lobby shouting the 15,000 top 10 things to do in the city because guess what? You’re not going to love all of those things anyway, and this one wraps back right up to my budget travel tip number one, which was to plan ahead. I think the more that you are able to plan ahead, prepare for and focus on and do a little bit of research and see what is there there, what are the things that your family would enjoy if you’re going on a trip with your kids, spend a little bit of time thinking about them because guess what? Your kids will probably be just as happy or happier playing at the playground in the center of Rome or sitting on the beach building a sand castle in Mexico as they would be hopping on and off a tour bus or being on some big expensive excursion. That brings us all the way back around to number one. You could go straight through them again and I will because I love to give you a recap of what we talked about. I shared a couple ideas for ways to do that with next vacay flights from home and just digging in and preparing yourself for what you want to do and what you want to see. Enjoy some budget hotels and free breakfast along the way. Do a little bit more in fewer days or spend the same amount of travel budget in less time. Maybe try and all inclusive if you want to know exactly what you’re spending. 5. Eat And Live Like A Local. This is probably my favorite trip. I love Airbnb. Remember you can grab a $40 discount code on the show notes of this podcast. I love to shop at markets. I love to go on picnics when I’m on vacation. In fact, just a really quick segue into another adventure moment in my last couple trips, just as I’m sitting here recording, I can think of two times in the last year that I have had the most incredible sandwiches on vacation. One of them was on the beach of Positano, Italy, where our family was just hanging out on the beach for the day and I had gone to a local market and grabbed a loaf of bread and some sliced ham and cheese and it was just so good. We just sat eating. I mean, not even, there was nothing else on it, like no is no anything, just ham and cheese and this incredible crusty baguette and just sitting on the rocks, watching the waves crash, enjoying the sunshine and just seeing the incredible colorful buildings rise on the cliffs above me. And the other time was just again at Montserrat. I’d shared that magical adventure moment earlier in the segment after we listened to the choir seeing, we took another tram up to the hillside where we just sat and looked over the beautiful mountains and we had packed sandwiches that we bought at the cafe in the metro station, so we crabbed sandwiches and drinks and chips and you know even some churro donut things at the cafe insight the metro, you don’t get closer to eating like a local in a city than eating the food from inside the metro station. And it was one of my favorite meals of the trip because it wasn’t really that much about the food it was that we had taken it to this incredible place and we were just really experiencing it. It was probably a $4 sandwich and the moment surrounding it was incredible to eat and live like a local. By choosing a lower budget option and then adding a little bit of luxury at the end if you’d like. Go big on a couple things that you really, really are going to enjoy and then just enjoy the journey and the feeling of travel and adventure and have experience and especially if you’re with someone of togetherness and if you’re not with someone of that incredible, wonderful solitude that you can experience as you get to know yourself and your place in this big wide world. So I hope that that’s helpful on some level that maybe you’ve learned one or two new tricks or found out about something that you hadn’t really thought of before that could help you plan on spending a little bit less or feeling like what you have is enough to take a great family vacation. And that’s something I really just need to emphasize as we finish up this episode. It does not matter what your travel budget is, your travel budget can be $10 and there is something really fun that you could do with that, whether it’s grabbing ice cream and taking a quick road trip to a nearby town to wander through a flea market. Or if you’re a travel budget is $50 and you want to do a day trip to the beach and have enough money for gas and snacks and to just sit on the sand all day. I have traveled at every stage of life, both before I was married, when I was a single person, I did some traveling by myself and with friends. Dave and I traveled as a couple before we had kids. We traveled with our kids including that incredibly ridiculous trip to Jamaica that I talked about. I don’t know that we’ve ever done a completely luxurious, really super duper expensive, crazy trip. We’ve always traveled with a little bit of a budget mind and definitely for years and years and years, the most possible shoestring that you could find and guess what? Every single trip has been something that has added to our lives and we do not regret a single one. I wanted to thank you for being here and invite you as I always do and always will to share the episode with someone close to you. Send it in a text message to your sister or your cousin. Share it on Instagram posted to your Facebook page. If you haven’t yet subscribed, make sure you subscribe so you don’t miss any episodes. And every time a new one comes out, it’s already ready for you to listen. I have to give a shout out to pleasantpictures.club for all the incredible tracks that I use in the show every single week, including the intro. If you are looking for music for any type of creative application, you can use my code livefree15 to get 15% off of their subscription music service, and that’s it. I hope you have a really wonderful week. Happy trails. Talk to you soon.